Honey and Me is a boutique wholesale company specializing in original, unique designs of seasonal, home décor, and fashion collections. The Fall and Halloween collection features harvest pieces, fall florals, and classic Halloween items. 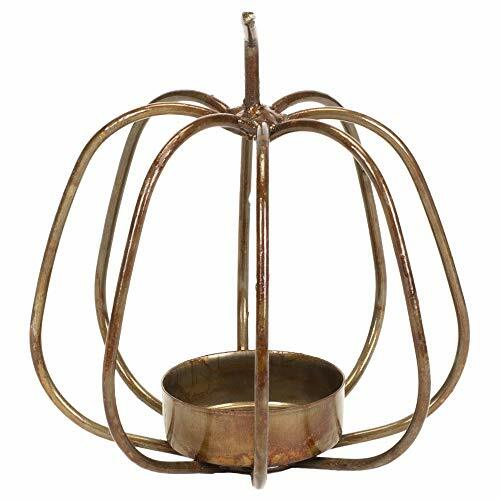 Pumpkin tea light holder is a metal pumpkin outline with a twisted wire stem (tea light candle sold separately). Made of metal material with a rustic silver toned finish; Perfect for harvest and fall decorating themes. Each pumpkin measures approximately 5 x 4 inches; Perfect for adding interest to decorating spaces. Primitive style with distressed details gives this home accent vintage charm . Ships in protective packaging; Perfect for housewarming and feathering the nest. If you have any questions about this product by Honey In Me, contact us by completing and submitting the form below. If you are looking for a specif part number, please include it with your message.